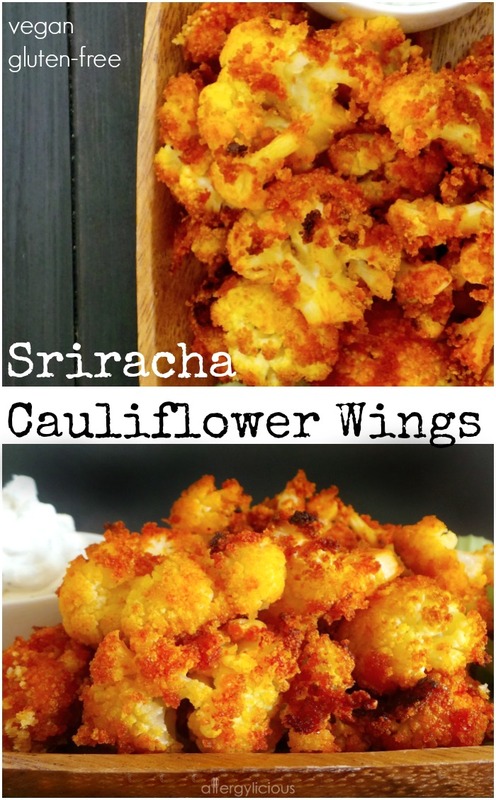 “Sriracha cauliflower wings are my Bae”, or at least that is what my daughter says. This is HUGE as it is coming from my not completely vegan child who has labeled herself as a “chikatarian” (she likes Chik-fil-a basically). I know, this is technically a vegan food blog, but to be perfectly honest, I just cannot make everyone eat as I would. Now, when we are home, I only make 1 dish and everyone eats that 1 dish, but when we go out, they are all free to make their own choices. Thankfully, they no longer go crazy when they order and have realized how certain foods make them feel as well as realize how eating foods affects other creatures, but chicken, I can’t quite get her to give up yet. Thankfully, my kids all LOVE vegetables and so getting them to eat veggies is really easy. 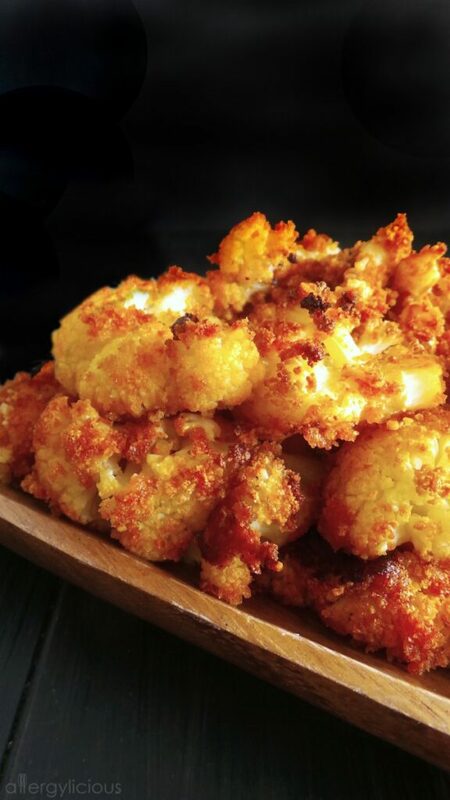 Cauliflower is one of their favorites, whether its raw or cooked and we’ve used this veggie as a substitute for rice or mashed potatoes and even in shrimp cocktail. It also works well as “chicken” for making wings. I mean, it’s better than eating “fake” meat made of weird ingredients, right? What makes these “wings” even better, is that I used a wonderfully, spicy sauce called Sriracha. Have you tried it yet? If not, and if you like a little (or a lotta) heat, then you’ve gotta get yourself a bottle. So, just how do you make some wings made from cauliflower? Let me show you,,,,it’s pretty easy. 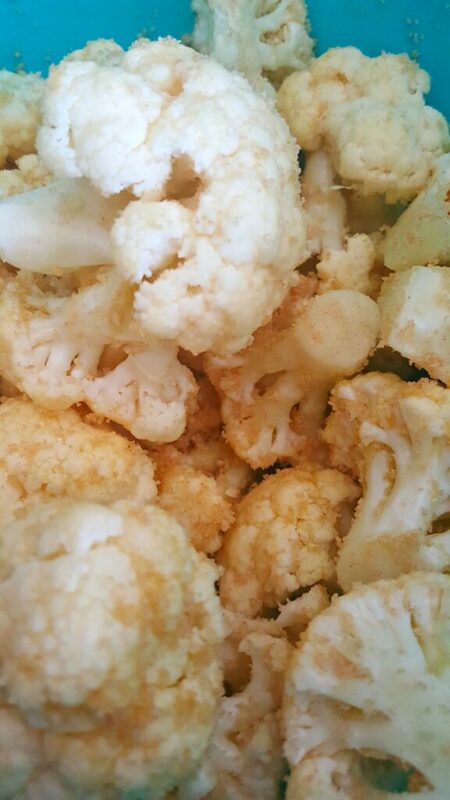 Grab your cauliflower & cut it up into bite size florets. Drizzle with a little olive oil then coat with your bread crumb mixture. This keeps it nice and crispy on the outside. Then bake. Now, you’re not going to add your Sriracha until it’s been baking 15 minutes at least. You want the sauce to form its own layer AFTER it’s already cooked a little. Otherwise, you won’t taste much of it and it can tend to get a little soggy. Now you bake a little longer and there you go, you’ve got yourself some wonderfully spicy, wings for your next shindig. I’m amazed that I was even able to get the photos I did. As soon as my kids saw I was making these, they were swarming around the kitchen waiting for the “ok” to start digging in. Make it even more authentic with some dairy-free, gluten-free ranch. 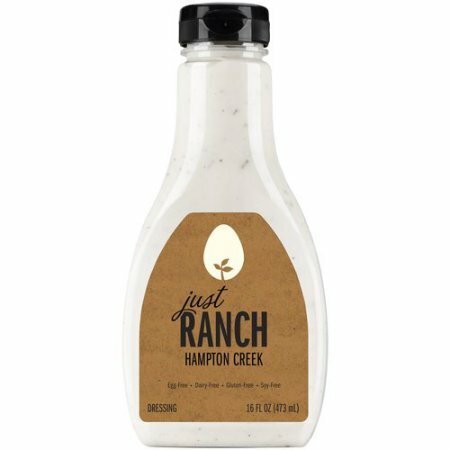 I love to make my own (which is in recipe below), but if you’re happen to be in Wal-Mart, pick up from Just Ranch by Hampton Creek, because this stuff is wonderful! This is what it looks like & it is in the dressing section. They also have Just Mayo (Sriracha flavor is my fave of course) which is also dairy, egg, nut and gluten-free. no kickbacks from this product, I just love it! Are you ready to add a little heat to your life? Try something a little different? Impress some friends? Allergy-friendly, Vegan approved Healthier version of Buffalo Wings using wonderful cauliflower florets & spicy Sriracha sauce. Whisk all ingredients together & chill before serving. Add a little non-dairy milk if you want it a little thinner. In a large bowl, combine bread crumbs, garlic powder & salt. 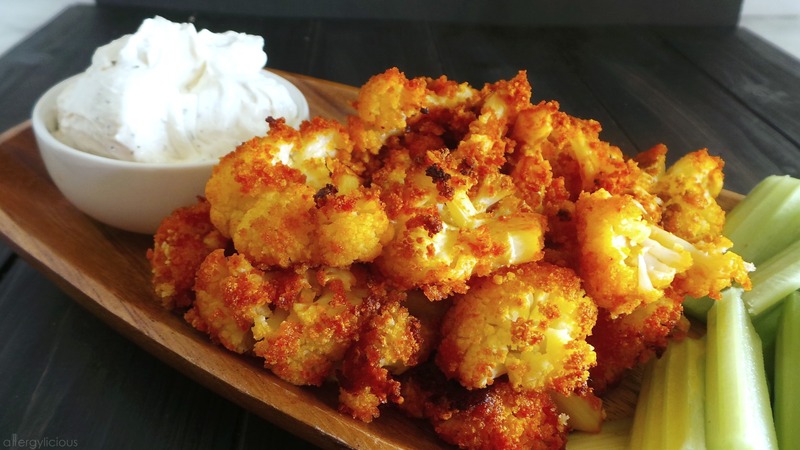 Drizzle cauliflower bites with olive oil then coat in bread crumbs. Transfer to a large baking sheet covered in parchment and roast 15 minutes. Whisk together melted butter and Sriracha. Remove from oven and now coat with Sriracha using a plastic pastry brush, making sure to evenly distribute. Transfer back to parchment lined baking sheet and bake another 10 minutes, until crispy. Serve with celery & vegan ranch dip. What’s your favorite party food? 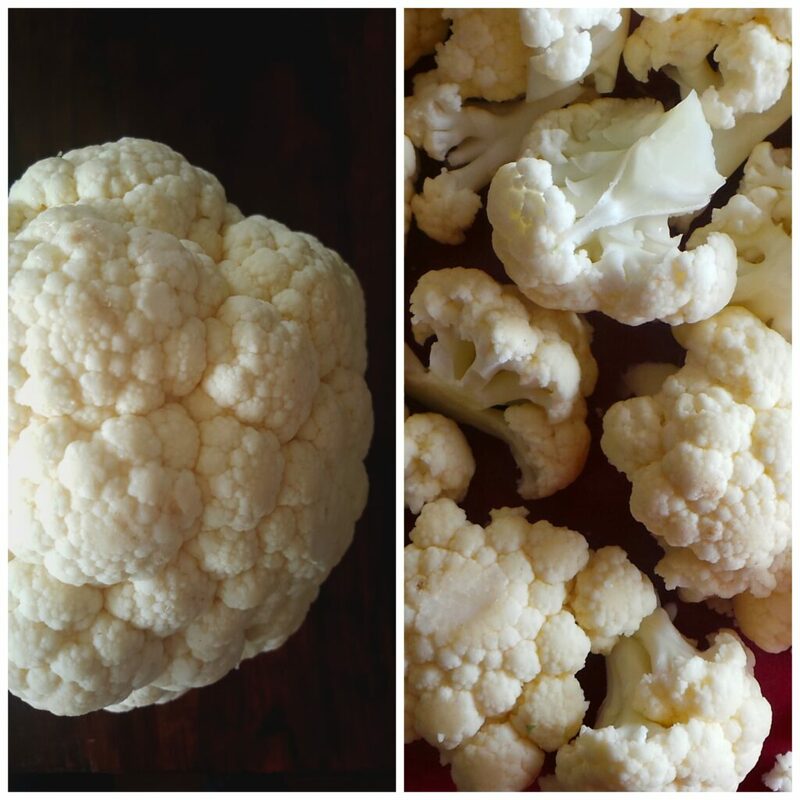 What fun or unique way have you used cauliflower in a recipe? If you could only pick 1 condiment to keep in your house, what would it be?